The Shetland Sheepdog or Sheltie is an intelligent breed of dog that has been known to carry a variety of interesting names related to its origins. Many great names can be borrowed from the Shetland Islands among which the breed first appeared. Balta, Fetlar, Linga, Oxna, and Vaila are a few island inspired options. Many names of Scottish origins are favorites among Sheltie owners around the globe. A few of the top male Scottish choices are Finley, Ross, and Duncan. For a female, Maisie, Sheona, and Kirstin are popular. The Scottish Isles are known to have some powerful storms particularly during the winter months. Stormy, Rain, Lightning, and Gale are few weather derived names. 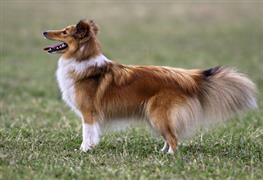 The Sheltie is a high energy and hard working breed originally developed for herding sheep. Some fun names inspired by Italian made sports cars include Maserati, Ferrari, Alfa, Romeo, and Lancia. Some of our pages will contain a subcategory. A subcategory is a slightly more specific grouping than the main topic of the page. For a subcategory, we will include a separated table of names and corresponding descriptions. An example of a subcategory of Red Dog Names would be 'Dog Names Inspired by Red Wines'. If you have any subcategory ideas for the Shetland Sheepdog Names page, we would love to hear them. Use the form below to submit your ideas.